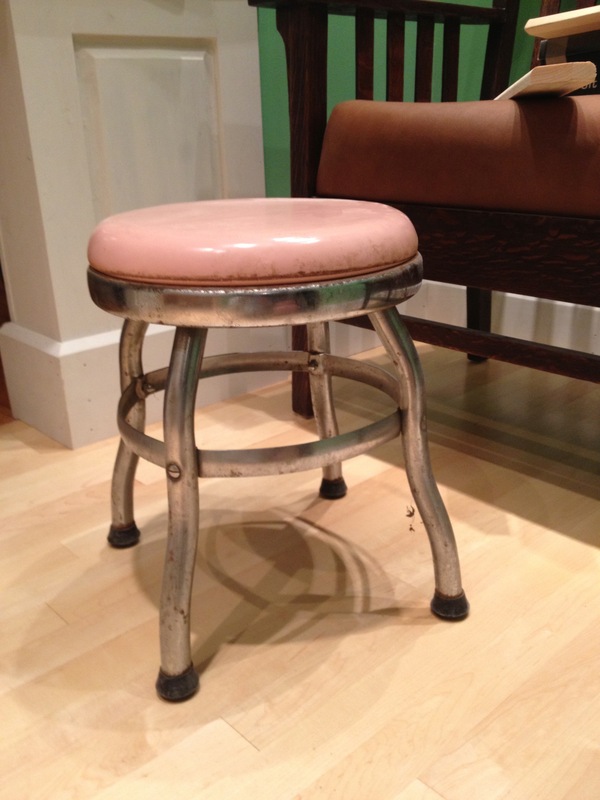 ← Month of Makeovers, Day 8: Hey hey, it’s a monkey! It’s a little rusty-looking, too. And it’s pink—very sweet, but unfortunately not a good color for a bathroom in my house. The vinyl is scuffed up anyway, so I don’t feel so bad about replacing it. I’m just not sure with what, yet. First task: take it apart! 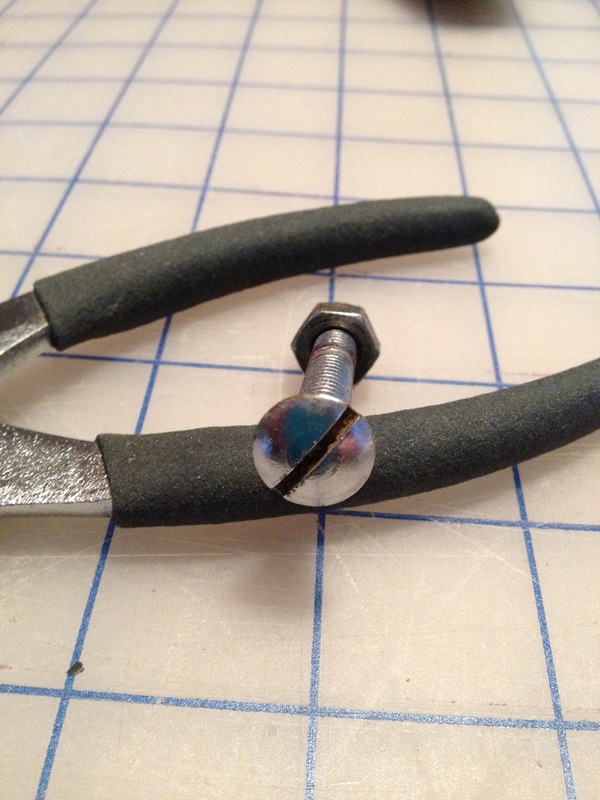 None of the screws budge, despite all the hours I’ve put in lifting weights at the gym, so I change my strategy. New first task: call in one of my trustiest helpers. 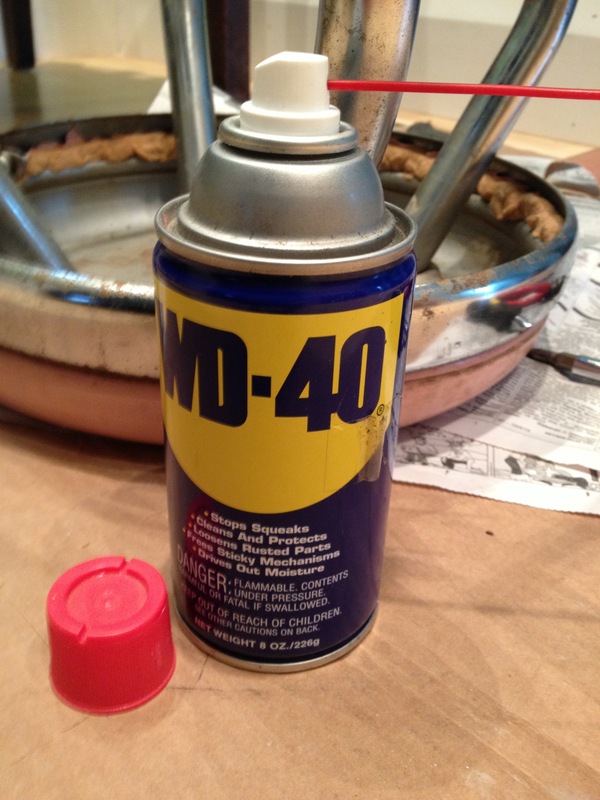 Yep, WD-40. It’s not just for big brawny mechanic types. One squirt and the stuck bolts release. The chrome band holding on the vinyl pops off like a giant spring. I give all the pieces a really good shine with another of my trustiest helpers: quadruple-zero steel wool. 0000 steel wool is not very photogenic. Every picture I take of it comes out looking like a piece of something that’s gray and furry with mold after three months being stuck in the back of the fridge, so I give up taking pictures. Just imagine it in your head if you need a picture. The steel wool, not the mold. Heavy, beautifully made hardware—one of my favorite things. I’m weird that way. I once spied an antique brass doorknob set on a trashed door at the town dump. Luckily I had a screwdriver with me, because I couldn’t bear to see that door set get thrown away. Anyway. There are no doorknobs in this project. Just lots of curvy chrome. 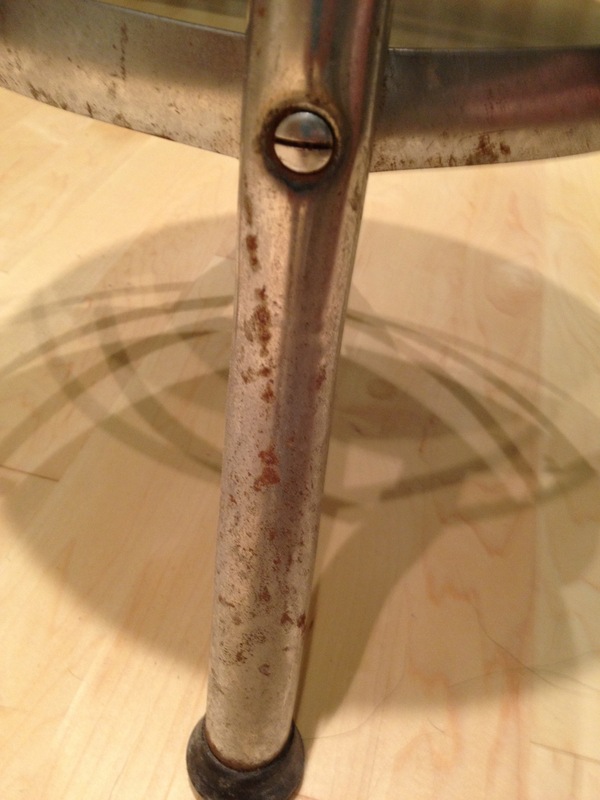 The surface rust polishes right off the metal. Some rust has eaten a little deeper into the chrome and won’t polish off. I do the best I can. Now for a new seat covering! I rummage through my stash and find a chunk of greeny-blue vinyl with a polyester knit backing. I bought it for a different project and had this chunk left over. There is just enough for this seat. 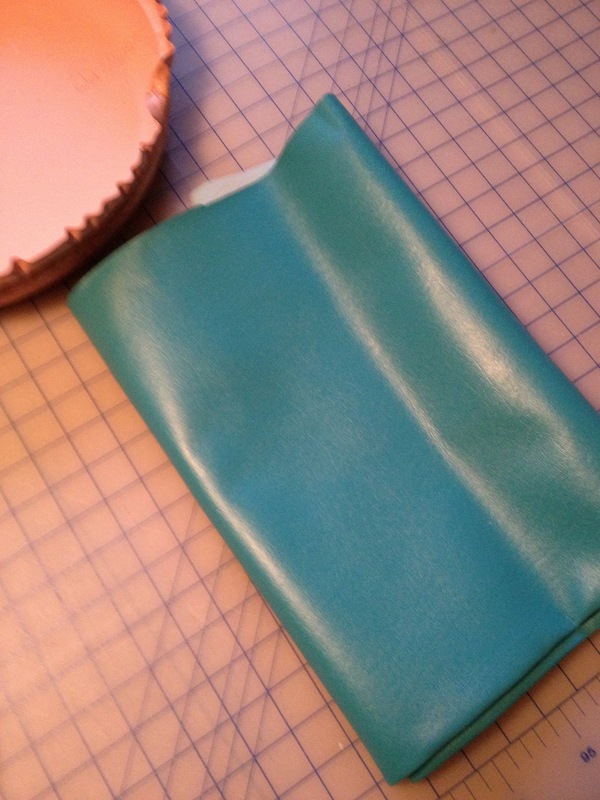 And it is the most absolutely perfect color for this project because . . . well, you’ll see in a minute. I stored the vinyl folded, though, so it first needs a light touch-up with the iron. You can iron this stuff right on the poly knit backing, no press cloth required. Just keep the heat low. Don’t iron the front side—you will melt it! and drape it over the padding. The padding’s still in good shape so there’s no need to replace it. But right away I see a problem. The new poly-backed vinyl is far thicker than the old pink stuff, and it doesn’t actually drape. It just sticks out. 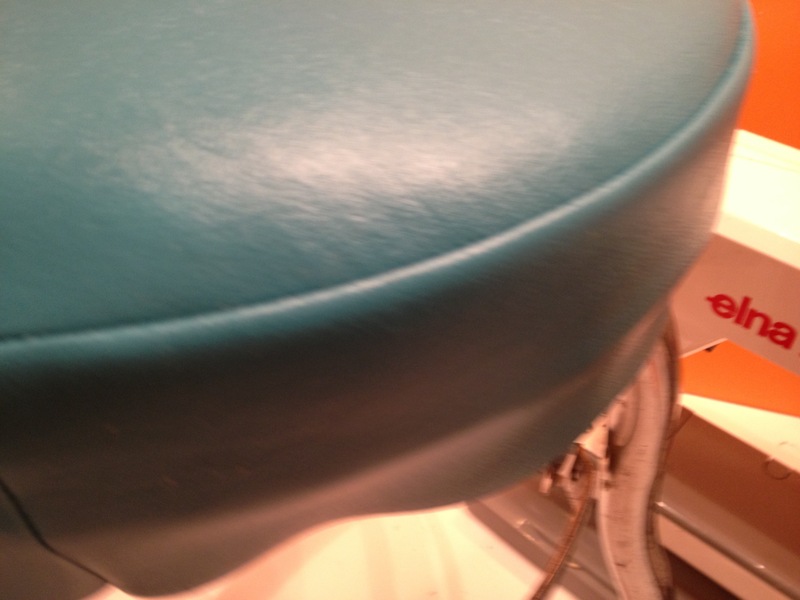 I try fitting on the chrome band and easing the blue-green vinyl smoothly under it. But it doesn’t have any stretch. So . . . nope, not happening. Lotsa big ugly wrinkles. There is just too much fabric to fit neatly down the sides of the seat. Ugh! 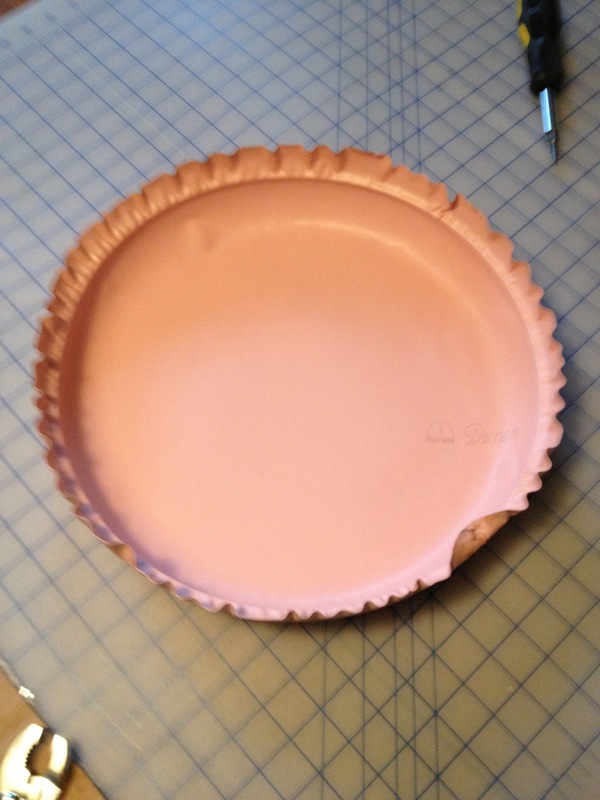 I look again at the pink vinyl cover, and now I realize that it was probably heat-formed in a mold to give it that perfect shape and smoothness. Darn, this is going to be a little trickier than I thought! I make a cup of tea and think about this. Everything’s more bearable when you’re sipping a steaming mug of PG Tips with milk and sugar. 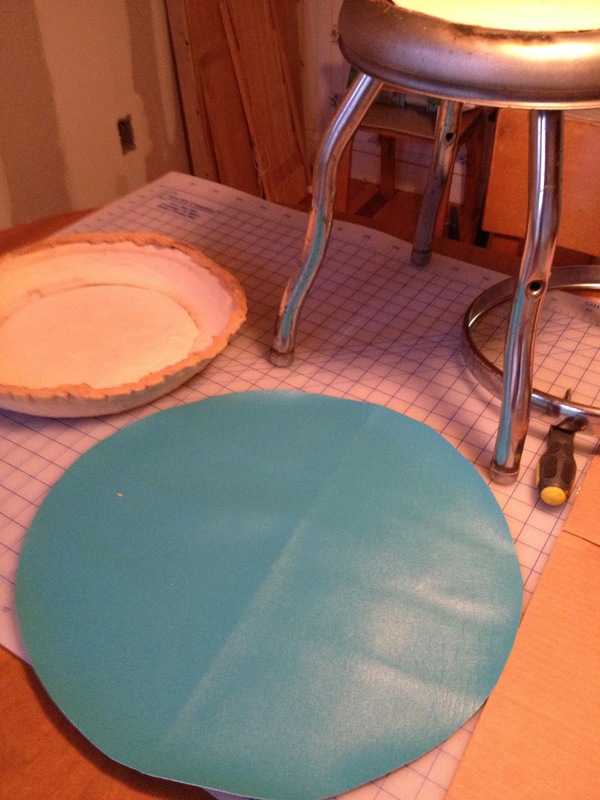 What if I cut the circle of vinyl smaller, just the size of the top surface of seat? 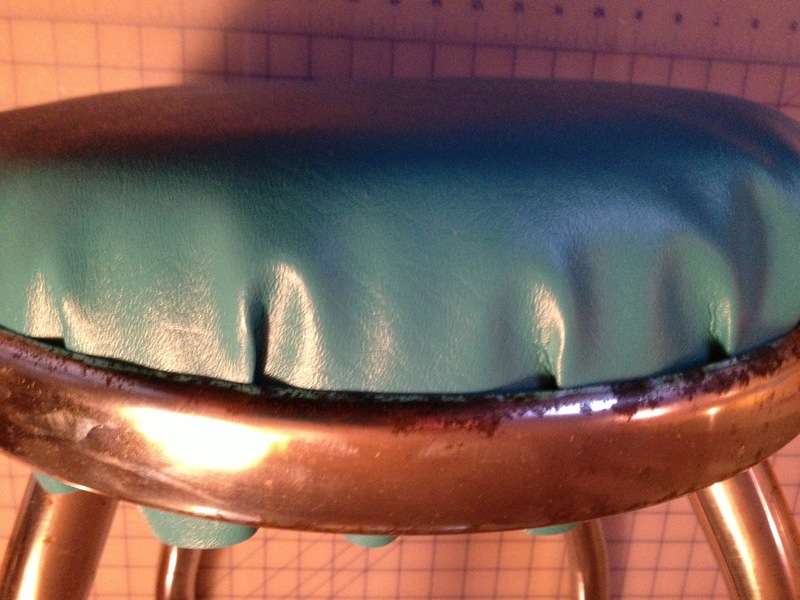 And sew a long strip to the circle to form the sides of the seat that will hang straight down instead of sticking out? You following me here? and cut a long straight strip about 4 inches wide. 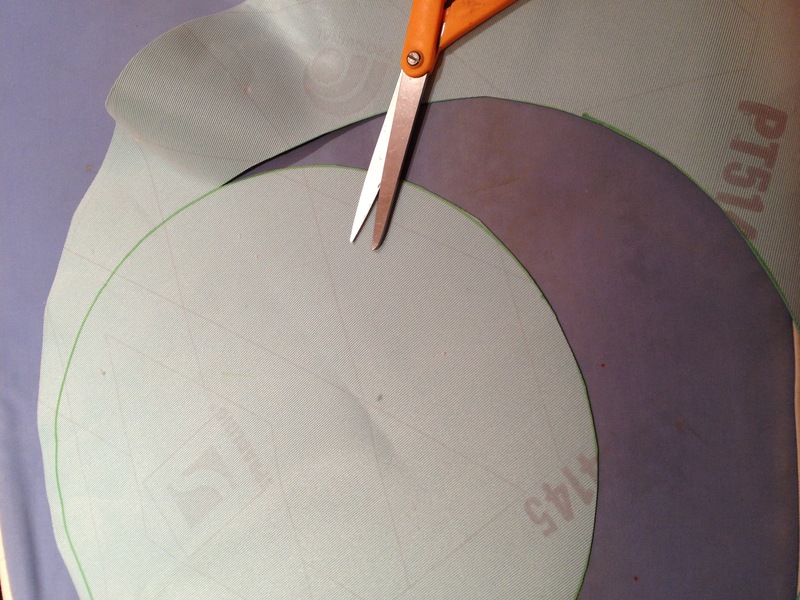 Then I sew the long straight strip around the outside of the circle. 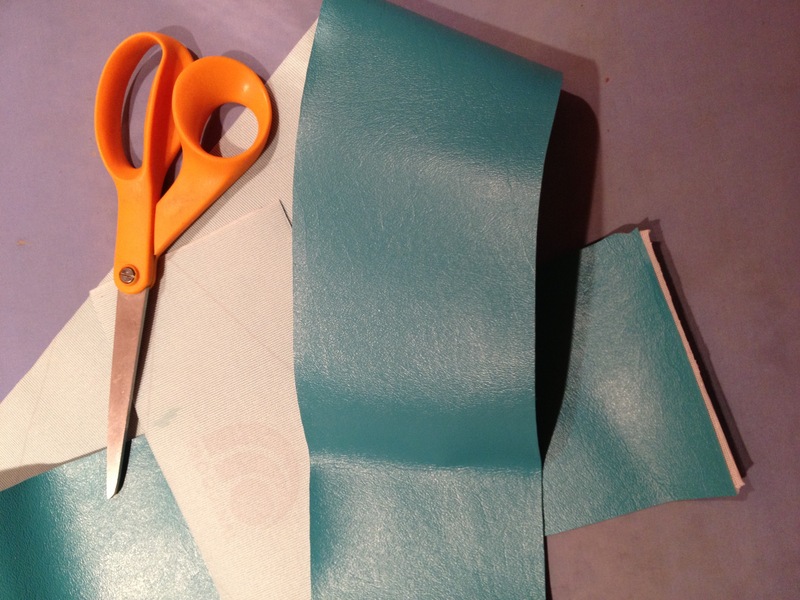 I use a slightly longer stitch length to avoid a “perforation” effect that will weaken the seam. 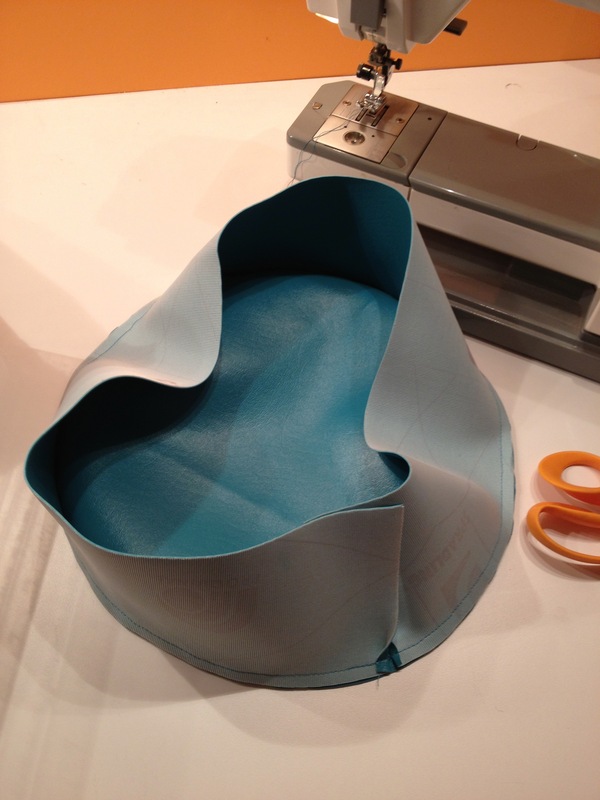 Turns out this vinyl is very easy to sew, as long as you’re working with more-or-less straight pieces. I wouldn’t try to sew any complicated corners or tight curves. When I’m done it looks like this. 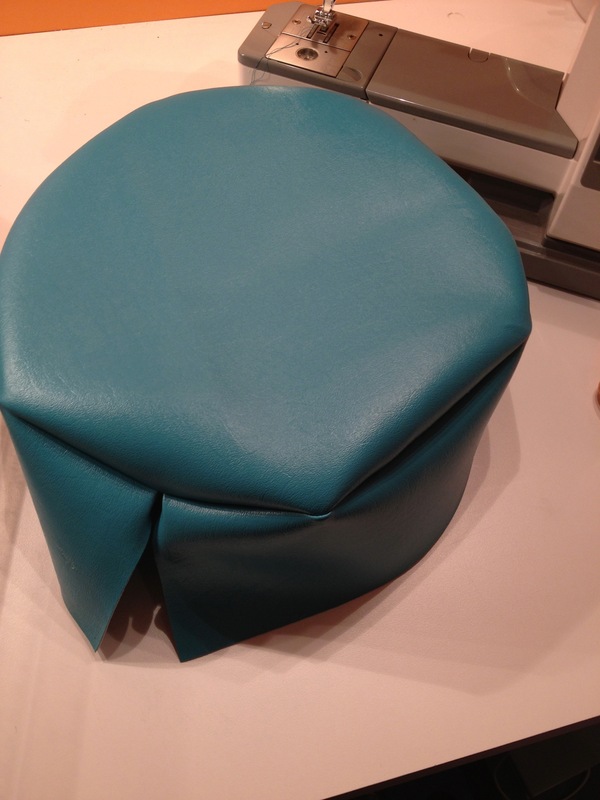 Kind of like a pillbox hat! I turn it right side out and finger-press the seams. 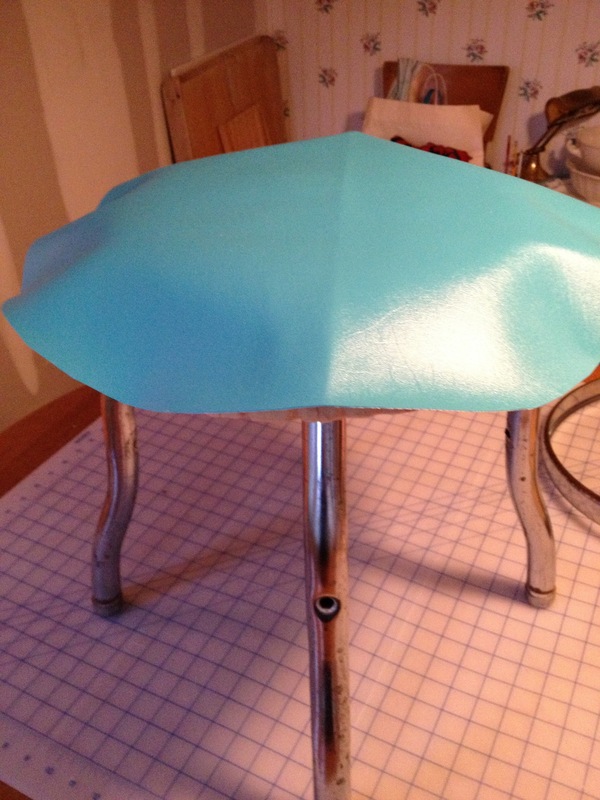 Then I fit the vinyl over the top of the stool and see how it looks. 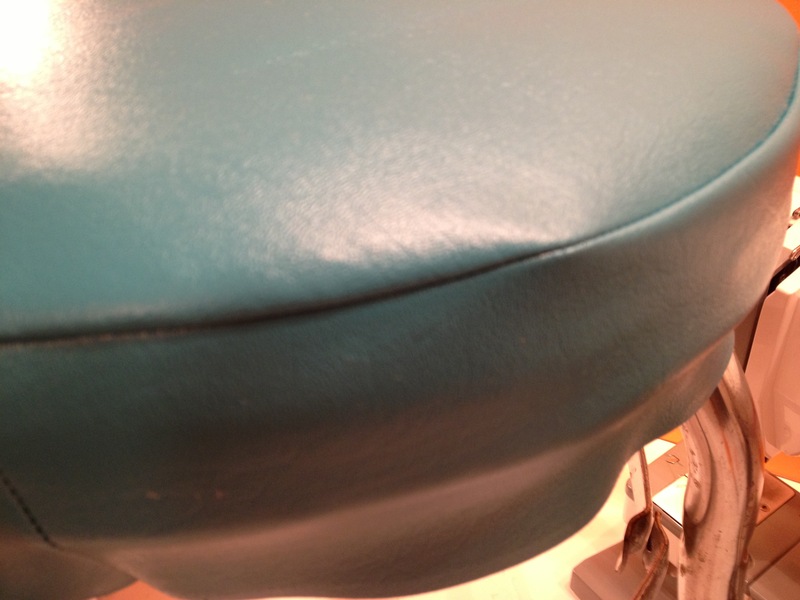 The seam I just sewed wants to flip up toward the top of the seat, making the seam look lumpy on the outside. I slide a finger under the edge to pull the seam down, all the way around. Much smoother! Fasten down the chrome ring, and I’m all done! And that perfect greeny-blue color? Ta-da! 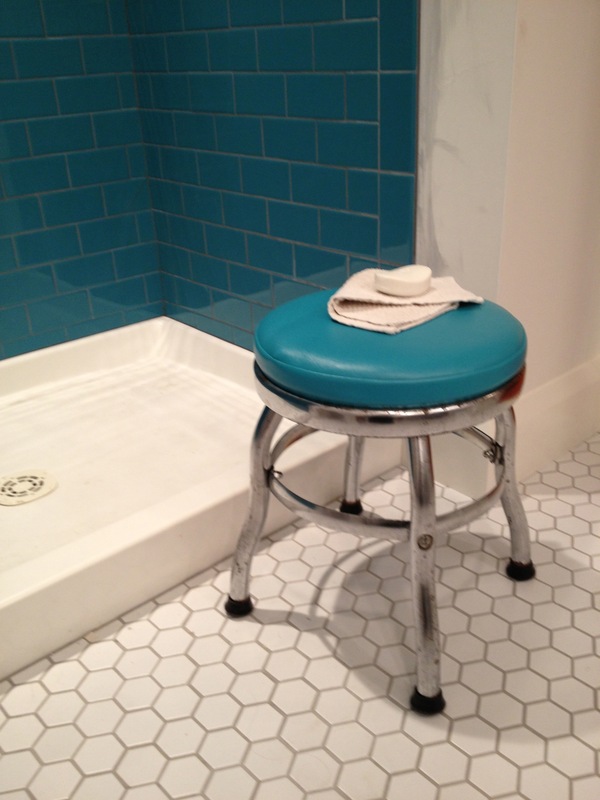 It matches the subway tile in my new retro shower exactly. Thank you, Reeve! Now if I can only get the rest of the bathroom done . . .